The study of intuition and its relation to thoughtful reasoning is a burgeoning research topic in psychology and beyond. While the area has the potential to radically transform our conception of the mind and decision making, the procedures used for establishing empirical conclusions have often been vaguely formulated and obscure. This book fills a gap in the field by providing a range of methods for exploring intuition experimentally and thereby enhancing the collection of new data. The book begins by summarizing current challenges in the study of intuition and gives a new foundation for intuition research. Going beyond classical dual-process models, a new scheme is introduced to classify the different types of processes usually collected under the label of intuition. These new classifications range from learning approaches to complex cue integration models. The book then goes on to describe the wide variety of behavioural methods available to investigate these processes, including information search tracing, think aloud protocols, maximum likelihood methods, eye-tracking, and physiological and non-physiological measures of affective responses. It also discusses paradigms to investigate implicit associations and causal intuitions, video-based approaches to expert research, methods to induce specific decision modes as well as questionnaires to assess individual preferences for intuition or deliberation. By uniquely providing the basis for exploring intuition by introducing the different methods and their applications in a step-by-step manner, this text is an invaluable reference for individual research projects. It is also very useful as a course book for advanced decision making courses, and could inspire experimental explorations of intuition in psychology, behavioural economics, empirical legal studies and clinical decision making. 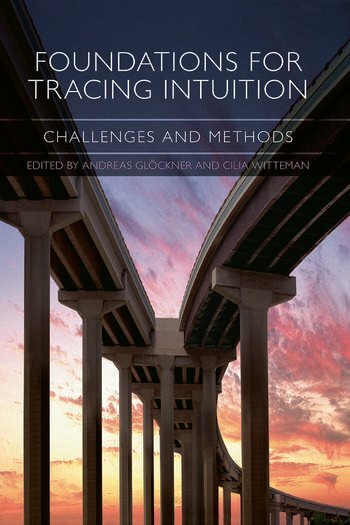 A. Glöckner, C. Witteman, Foundations for Tracing Intuition: Challenges, Findings, and Categorizations. E. Norman, M. Schulte-Mecklenbeck, Take a Quick Click at That! : Mouselab and Eye-Tracking as Tools to Measure Intuition. C. Witteman, E. van Geenen, Cognitive Process Analysis. A. Bröder, Outcome-Based Strategy Classification. A. Glöckner, Multiple Measure Strategy Classification: Outcomes, Decision Times and Confidence Ratings. G. Schweizer, H. Plessner, R. Brand, Studying Experts’ Intuitive Decision Making Online Using Video Stimuli. R.W. Holland, M. de Vries, Implicit Evaluation as a Basis for Intuition. G. Hochman, A. Glöckner, E. Yechiam, Physiological Measures in Identifying Decision Strategies. Y. Hagmayer, Investigating Causal Intuitions. S. Dickert, Measuring Affect and Emotions in Decision Making: The Affective Side of Intuitive Information Processing. F. Renkewitz, G. Jahn, Tracking Memory Search for Cue Information. N. Horstmann, D. Hausmann, S. Ryf, Methods for Inducing Intuitive and Deliberate Processing Modes. P. Koele, G. Dietvorst, The Internal Validity of Self-Report Measures for Intuitive and Rational Decision Making. C. Betsch, P. Iannello, Measuring Individual Differences in Intuitive and Deliberate Decision Making Styles: A Comparison of Different Measures. Andreas Glöckner is head of the research group Intuitive Experts at the Max Planck Institute for Research on Collective Goods, Bonn. In addition, since 2004 he has worked as an independent consultant for human resources. Cilia Witteman is professor of Diagnostic Decision Making at the Behavioural Science Institute of the Radboud University Nijmegen. She has been secretary/treasurer of the European Association for Decision Making since 2005.